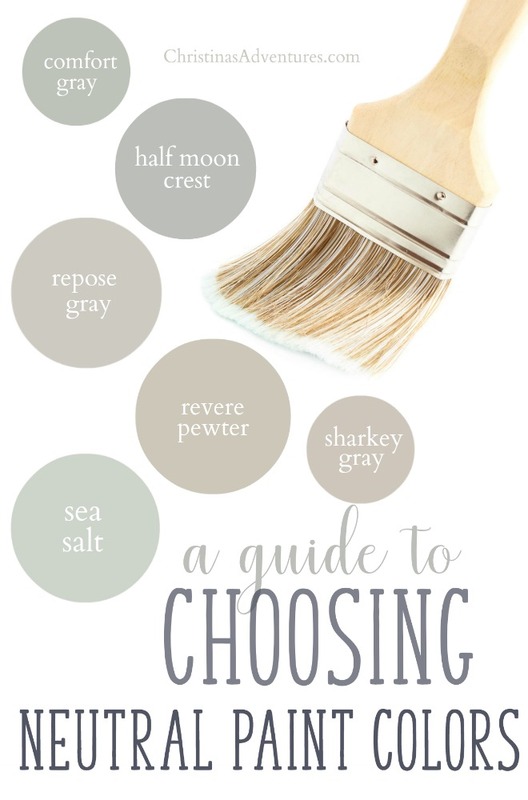 Inspiring pictures and tips for choosing neutral paint colors for your house. Don’t waste your money on paint you won’t love without reading this paint color guide first! This post contains affiliate links – full disclosure here. Click "next" to see all of the best neutral paint colors and the real-life pictures to go with them. Click “next” to be inspired by the best neutral paint colors out there! By the way – these are my absolute must-have paintbrushes! I loooove them- they give great results without brush strokes, and they last a really long time. I have a little bit of a problem with patience. OK, maybe a big problem with patience. See, when we decide to paint a room, I never have make time to pick out paint options, get samples, and then test them. But this time I actually put samples on the wall -and wow, I’m glad I did, because I ended up loving the colors I thought I’d hate, and hating the colors I thought I’d love! Moral of the story: if you are able to be a little patient, testing paint samples on the wall is really really worth it! If you seriously can’t get paint samples and put them on the wall (I get it) then at least do me a favor and look the paint colors up online before you choose. DO NOT CHOOSE FROM A PAINT CHIP. I repeat –do NOT choose from a paint chip! They are usually dramatically different than how the actual color will look on your walls! If you like this post, please share with other and save for later by pinning it here! I saw that you have a home with beautiful dark woodwork, same here. Did theses cool neutral colors work well with them? I am (impatiently) about to paint 🙂 and worried about the grays against the dark trim. I have been wanting to repaint my home for a while, but I would really like to get them painted in neutral colors. I especially like the gray color palettes that you have here, they all look great! It would be really nice if I could pick out some of these neutral colors and then maybe add in some bright pops of color in the decor. Now I just need to consult with my husband on what he thinks, and then hopefully we can find a painter to get everything painted. Thanks for the great post! What would you say the undertones that come out of repose gray are? Good question Bryan – I love Repose Gray because it’s honestly a TRUE gray. Maybe slightly more on the cooler side – but it doesn’t have blue/purple undertones. Hmm not sure why yours showed up blue, Lucy! Ours are a very true gray in all of the rooms we’ve used it in. Hi there! I too saw a lot of blue undertones with Repose but I painted in a room with lots of light. I always love the color in pictures so decided to use it. I ended up repainting SW Collonade because its a warmer color and I love this choice. We are in the process of painting our kitchen cabinets Sharkey gray and I am having a terrible time deciding on a wall color. I was all set on Sea Salt, until my husband said it was too green and thinks I’ll get sick of it. So, we talked about going with a gray on the walls, too, with white trim. But there are SOOOO many grays – just when I thought I found one, I’m not sure. Any suggestions for a pairing with sharkey gray cabinets? 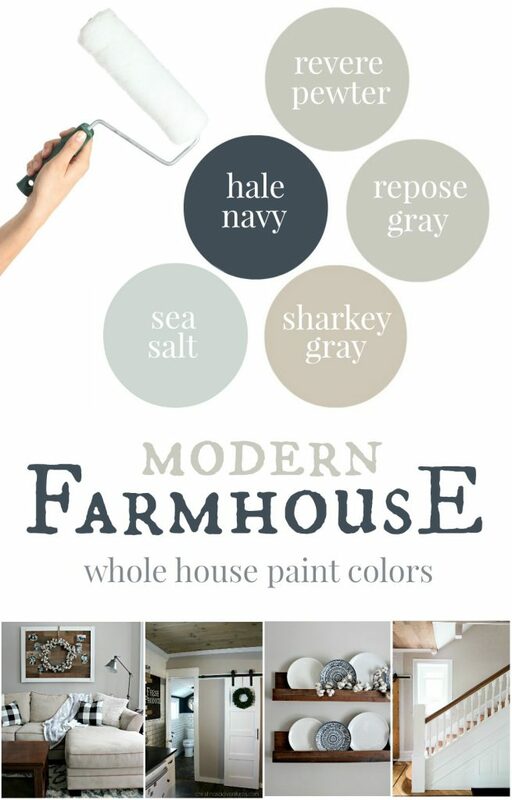 I am painting my new house and want to do the gray pallet. Unfortunately I don’t think Gray will go with my brownish goldish tile and brown carpet that is already in the house now. Do you think the color of the floor should affect what colors I put on my wall? One of the trickiest parts of interior decorating is getting the right paint color. It’s something that’s going to be on for a long time, so you definitely want to do it right the first time. I agree that choosing a neutral color is a safe bet. It gives you the freedom to change decor styles and color schemes whenever you want without having to repaint every time. You can still get creative with neutral colors, though, like you’ve so elegantly shown. Great post! How does sea salt compare to Restoration Hardware’s Silver Sage? Is it about the same? I love, love the sea salt, but I’m afraid it might be too close to SS, which I have in my bedroom. It’s hard to say if it is close because it looks baby blue in my bedroom, and dark green in my laundry room. 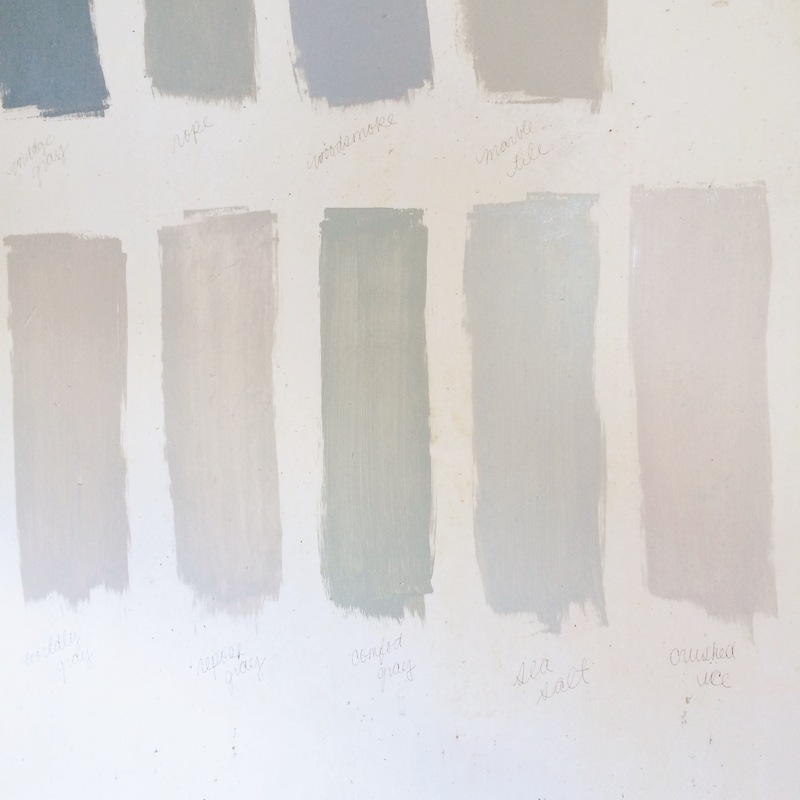 Christina, my husband and I just moved into an older house and want to change the paint colors. The tip about testing out the colors on the wall sounds like a good idea. I love the sharkey gray! I will have to test it out. If we like it I will give it to the painters we hire and hopefully they will do a good job! Yes- I definitely recommend testing on the walls first!! 🙂 We really love Sharkey Gray – we used it in our last 2 kitchen remodels 🙂 Best of luck with your painting! I need to paint my living room and hallways. I have always gone with a similar color to my furniture. I am finding that there may not be enough contrast in the room if I continue with this safe but boring theme. My new furniture will be chocolate brown recliners with a creamy light tan couch and love seat. The pillows have blue, mauve and light brown colors. I am considering Comfort Gray, what do You think? I live no where near a Home Depot. 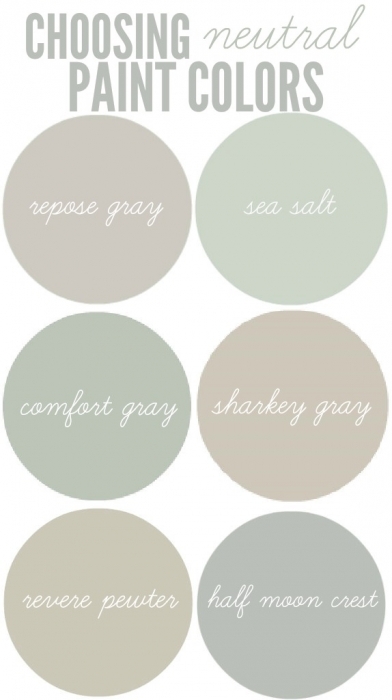 I would love to have the paint formula for Martha Stewart’s Sharkey Gray. because I LOVE it! Where can I get the formula for it besides Home Depot. Thanks. I want to paint my living room, but I’m so indecisive! It makes sense to choose a neutral color because this gives me more options to decorate my home with different furniture. I’ll definitely follow your example and paint test samples of paint on my wall! Thanks for these tips, Christina! We just moved into a new house that has crazy paint on the walls (red, greens, yellow, etc.) and we need to get them fixed but I’m just not confident in my ability to choose a color we’ll love. I like these suggestions, and I’ll be sure to try that tip before we get painters in. Ah painting over the crazy paint colors with the crisp neutral colors is truly therapeutic! Thanks for commenting, Janelle – I’m glad this was helpful for you! Thanks for your tips about how to choose neutral paint colors, Christina. You make a great point about how you will always want to do test paint samples on the surfaces you want to paint. I really like the sea salt color in one of your pictures. Another thing to consider is hiring professional painters for certain jobs. They will be able to paint those hart to reach areas without getting paint everywhere. Thanks. Christina. This site has been extremely helpful. I just found it this morning after several days of paint frustration. I love your comment not to trust the paint chips. They do not tell the truth until you paint the samples. You were spot on. My question. With the repose gray, what trim color for the baseboards are you using and what finish for the trim do you prefer? Thank you! Bill. I LOVE this post!! I have almost all of these colors in my home too! Your home is gorgeous!!! Love it all, especially the paint color! Please help! My wonderful sons wanted to do something nice for me while I was away on vacation and offered to paint the main living areas, i.e. kitchen, dining, living room, entrance, hallway, staircase (we have a rancher and the rooms pretty much run into each other.) Not having much time and loving the color schemes used by Joanna Gaines, I chose SW Oyster Bay. Beautiful color but a bit overwhelming. The only room they didn’t do was the LR. Was thinking maybe Sea Salt. Also, am going to have our maple kitchen cabinets painted. Our ceiling and trim is swiss coffee. What color for the cabinets? ANY suggestions would be greatly appreciated! It’s hard for me to do this without seeing the colors in your home – but I’d say go for white cabinets? And then you could do sea salt or if you’re looking for something that’s lighter gray, then I’d go with SW Repose Gray. Best of luck with your renovations! I’ve painted almost my whole house is Repose Grey. So perfect. Mindful Grey is a shade darker and great for southern exposure rooms. Have used Sea Salt, Revere Pewter and painted my dining room today in Repose Gray. Thank you for showing your color choices. We have an old Victorian with the original dark wood trim widows and molding. We are in the middle of a paint crisis trying to paint downstairs before our floors get refinished. Any suggestions on a blue tone gray for a living room color? We like the SW Aloof Gray in my foyer/hallway that opens to the living room, but my husband wants the living room to be a different color.